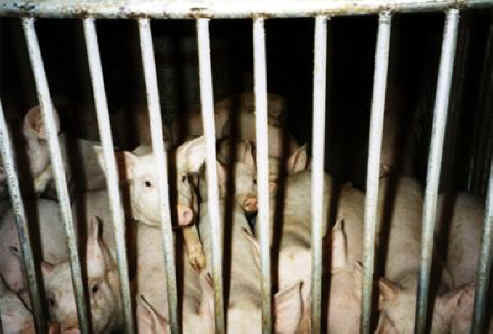 (Pig Exploitation - Factory Farming - 08) These little pigs were born in a factory farm prison. They were nursed in prison. And when they were taken away from their mothers, they were placed in their own jail cells. Yet even in the midst of this cruelty, they reach out with love toward humans, only seeking to be loved in return. They know what it means to truly love your neighbor. Why is this concept so hard for most humans to understand?